CAUTION: The pernicious alien plant CRASSULA HELMSI has been found growing on the exposed mud area at Startopsend and also at Wilstone. In order to stop its spread could all members and especially their dogs please not walk on these areas. 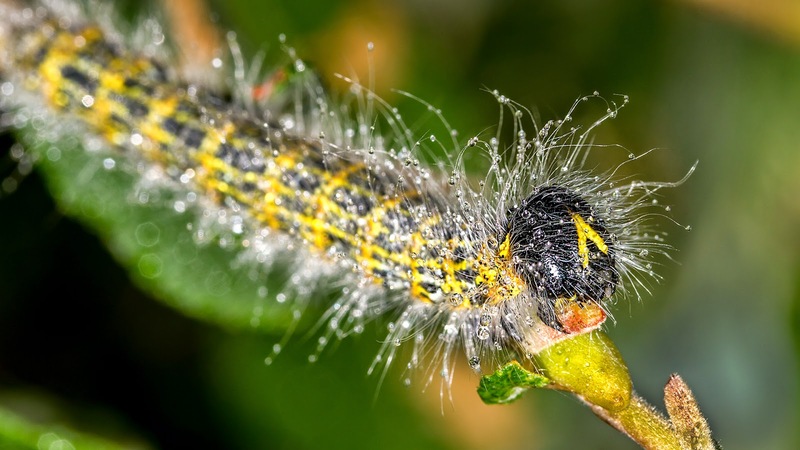 It just takes a minute piece of crassula attached to boots and paws to be transferred to a new area to cause it to spread at an alarming rate, smothering out native species and completely affecting the ecological balance of the SSSI. Plans to eradicate the plant are in hand. However your help is much needed to stop this invasion now. • Tuesday 30th September 2014. 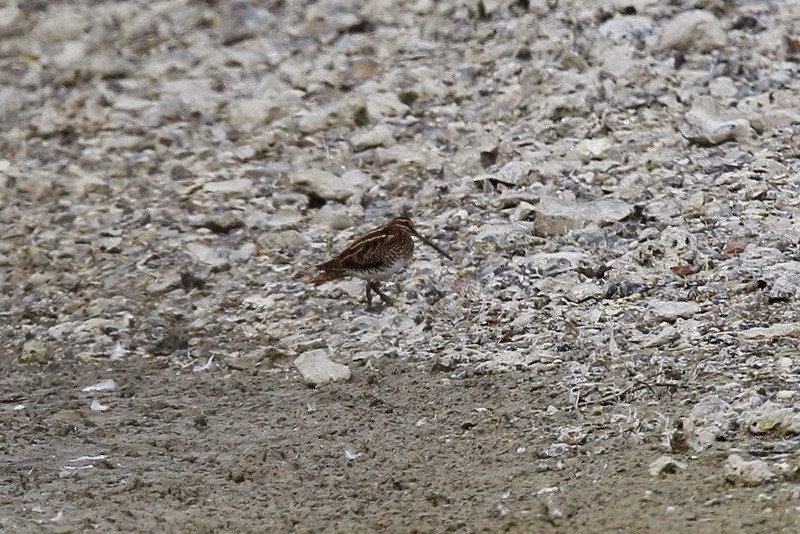 Mike Wallen - A really quick look at Startops and Wilstone produced a good flock of Meadow Pipit at the former and 2 Black-tailed Godwit, 2 Ringed Plover, a Common Sand and a Hobby at the latter. • Friday 26th September 2014. 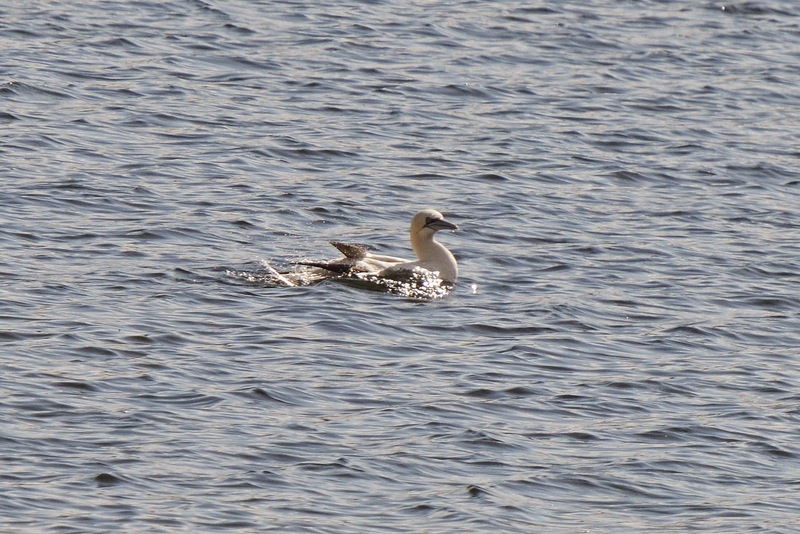 Mike Wallen - sub-adult Gannet : Wilstone Reservoir, (adjacent Bucks area). 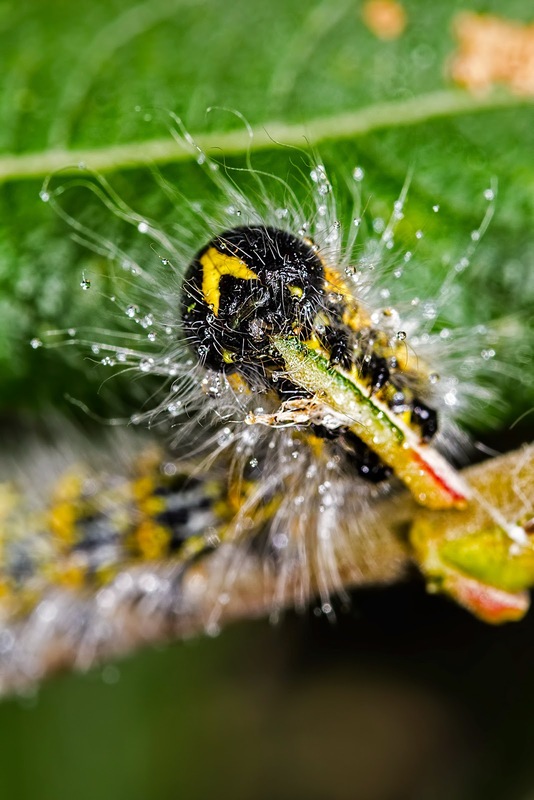 Near adult. 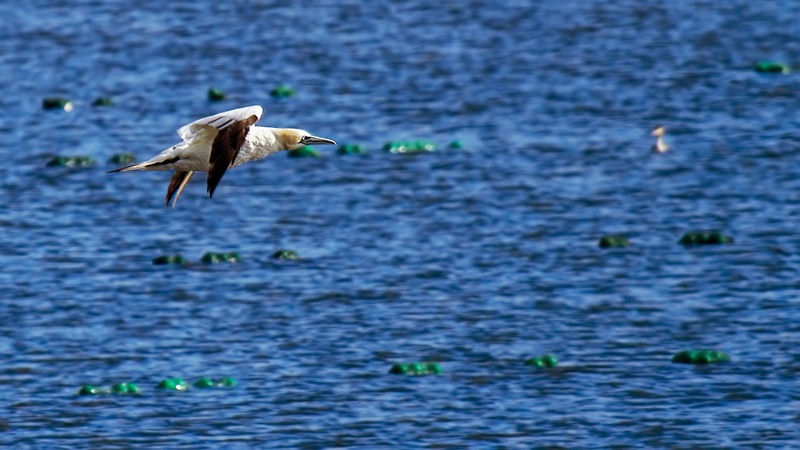 Seen to fly into reservoir at about midday. Spent approx. 3 hrs at Res, in which time flew around about 6 times and was very actively preening. 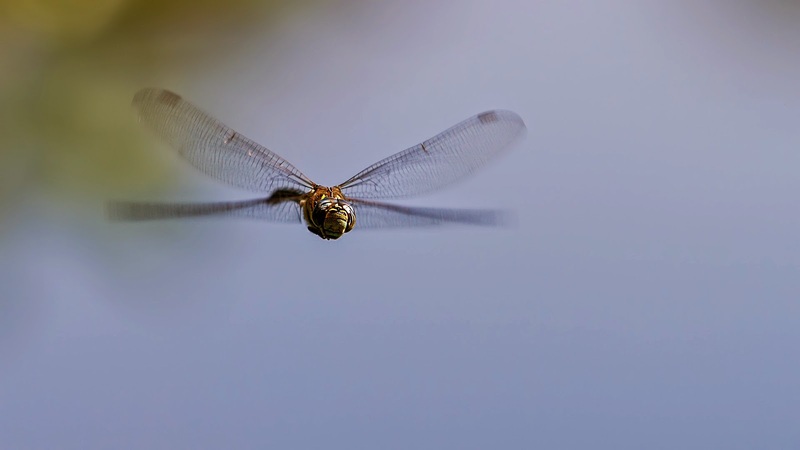 At about 1500hrs it took off and flew due West into Bucks until lost to view. At this point watched with Rob Andrews and Graham Smith. 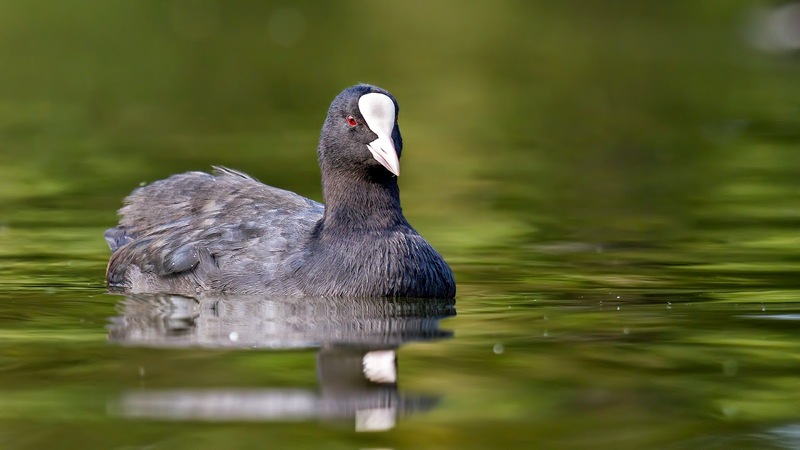 Editor - This bird was first found by Dave Bilcock and thanks to him and the other birders who got the word out so quickly. 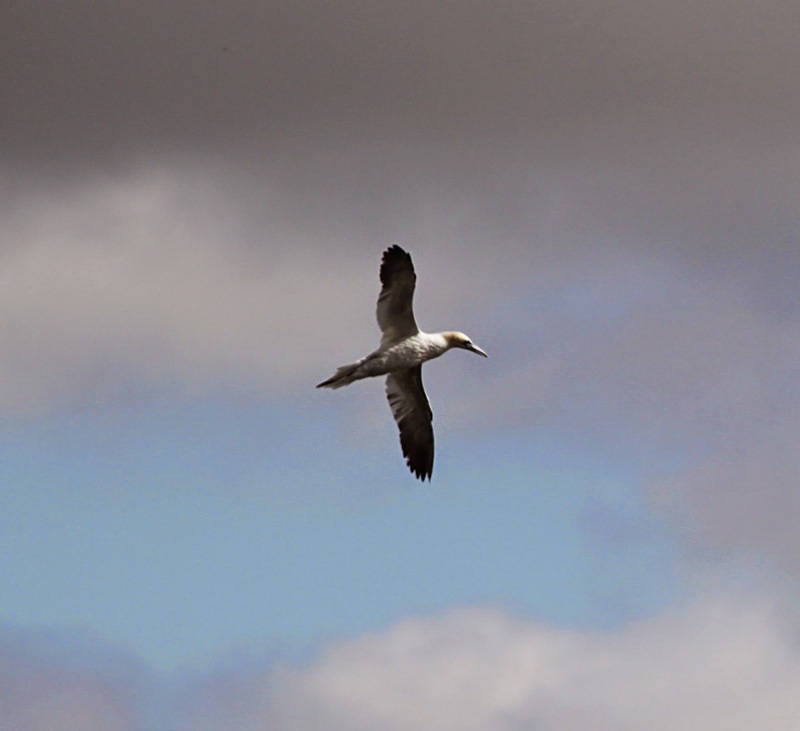 Roy Hargreaves - Today’s highlight was obviously the Gannet and I have attached what is probably my best of it on the water. The previous one that I saw many years ago didn’t settle on the water and turned up last thing and caused havoc with the gull roost before flying off into Bucks. First thing I did my normal walk round and saw eight Pintail, four Ringed Plover, three Black-tailed Godwit, Common Sandpiper and seven Chinese Water Deer and one Reeves’ Muntjac. Phill Luckhurst - 2 visits to the reservoirs today. Early on a quick walk in the fields near the old canal looking in vein for flowers with insects to shoot on them. 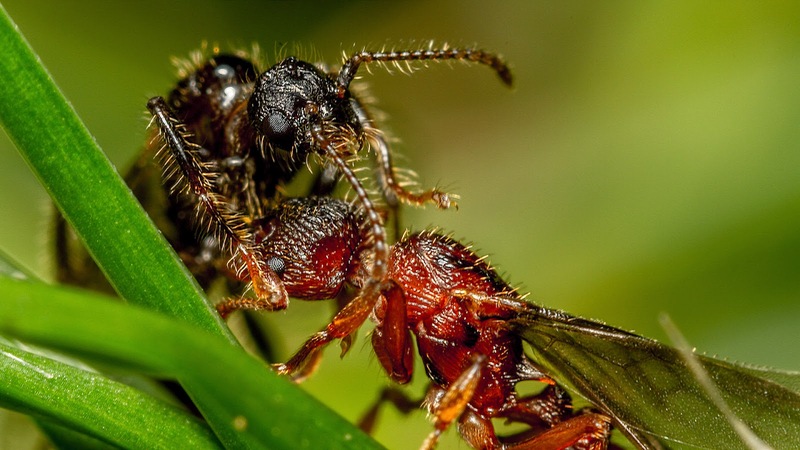 It seems all the insects bar a few wasps had overslept. 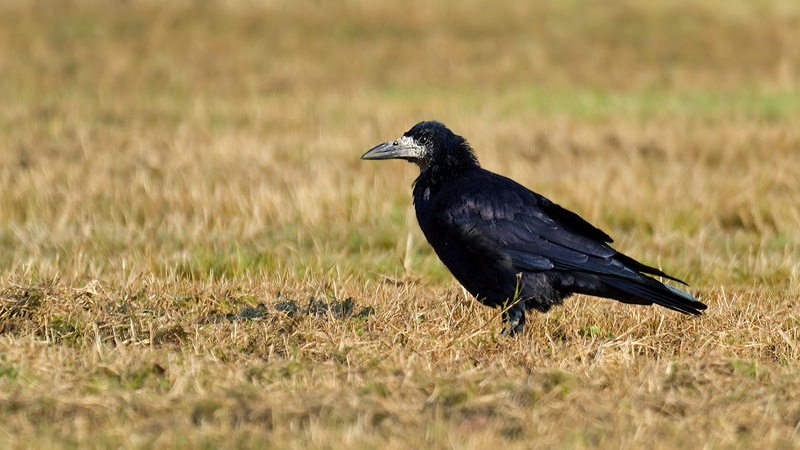 The Rooks were unusually adventurous today however getting quite close at times. 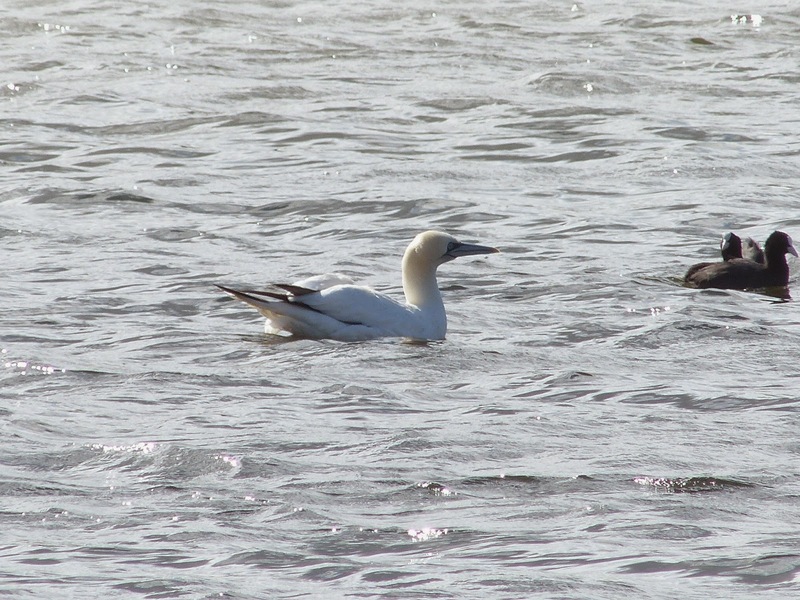 Later at work I heard news of the Gannet. I rushed to Wilstone and arrived to see it for just 5 minutes before it left. It was great to see so many enthusiastic people watching it, even one of the fisherman was getting excited. After walking around to see the Whooper Swans, some ragged and faded butterflies feeding on the mint and the usual waders I headed for home. I timed it perfectly as on turning into Drayton there were 3 Partridge in the field behind Wilstone. 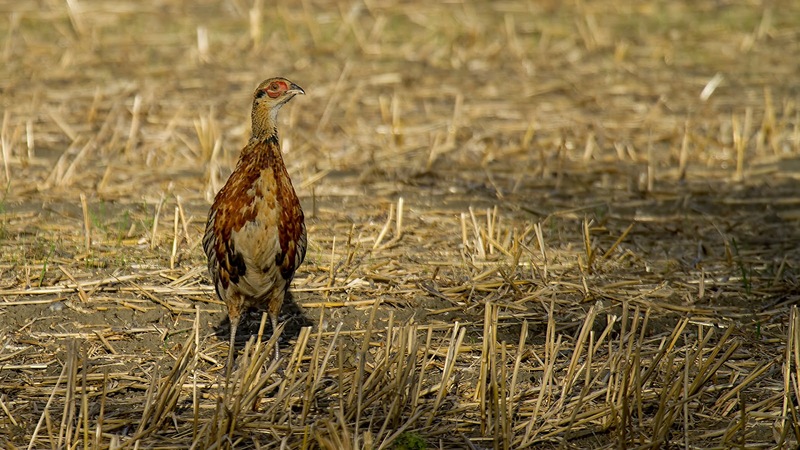 The Partridge vanished into the bushes before I could get a shot but the 2 Juvenile Pheasant seemed to think I was going to feed them and posed for a shot. • Thursday 25th September 2014. Roy Hargreaves - At last a morning that was clear and bright. From the jetty three Black-tailed Godwit, four Ringed Plover, Common Sandpiper and a couple of Pintail were the highlights. By the time I had got to the overflow the waders had moved to that corner and one of the Black-tailed Godwits was close to the bank and with careful approach was quite photographable. Three more Pintail were visible from the hide and I saw six Chinese Water Deer in all. Miswell Farm had a flock of about 200 Meadow Pipits as I counted at least 130 on the wires over one of the fields. 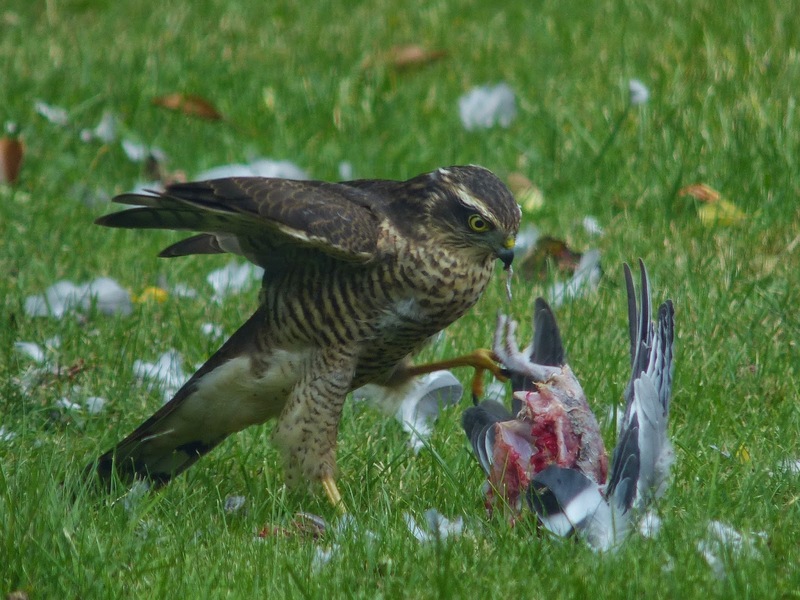 Yesterday I had watched a Sparrowhawk ripping apart a Woodpigeon and got poor photos and video. It returned this morning and again in the afternoon and the photos and video were both improved on in the brighter light of the morning. 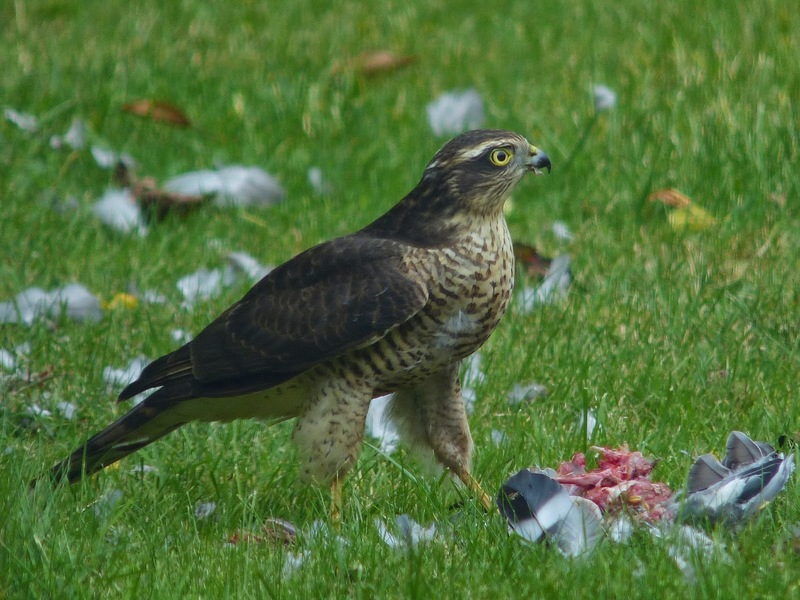 I was not aware that Sparrowhawks would return to a kill but clearly this bird did repeatedly so some research on my part is required to see how often this happens. • Saturday 20th September 2014. Roy Hargreaves - This week the four Egyptian Geese have been present on all days when I have got there early enough to see them before they flew off into fields near Wilstone village. This morning only two were present and I haven’t seen one with the faded eye-patch. Yesterday the Pintail had increased to five and this morning that number had increased to sixteen and the lone Shelduck is still about. 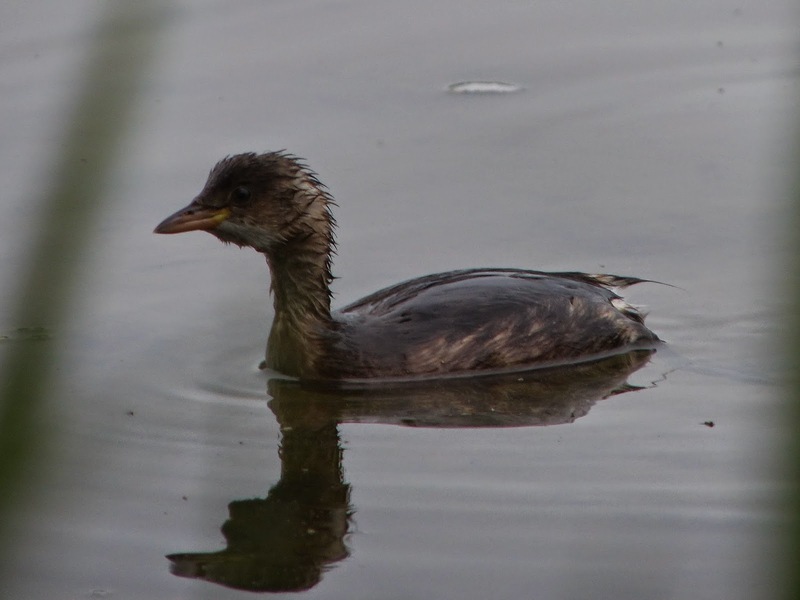 Today two red-crested Pochard on Wilstone and two on Tringford along with this young Little Grebe, which was close to the hide. 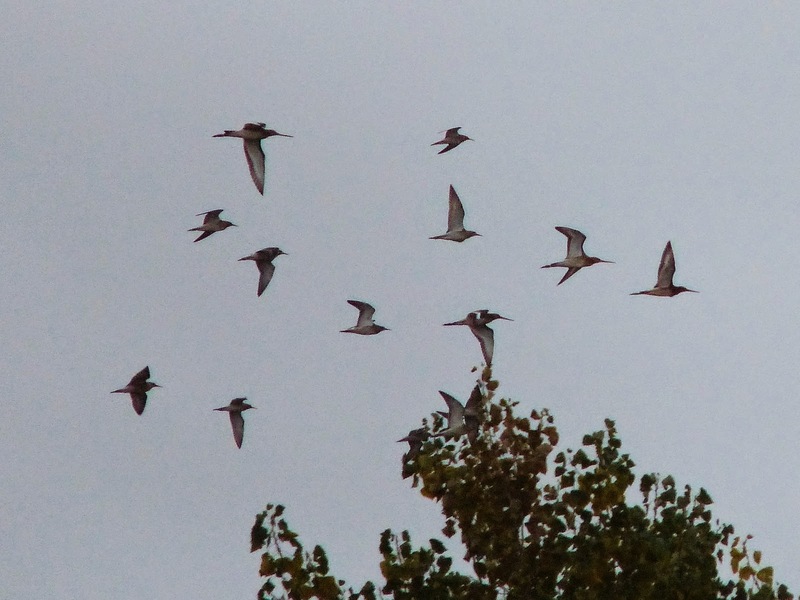 During the week the last of the Common Terns left for their wintering quarters. The misty, murky conditions on most mornings made it difficult to be certain what was actually around on most days, but waders seem to have been fairly static. Three Black-tailed Godwits, four Ringed Plover, one Little Ringed Plover, a few Snipe, two or three Common Sandpipers and a Green Sandpiper were about and a Redshanks was new in this morning. Yellow Wagtails were in the Rushy Meadow fields with the cows before flying off on Tuesday so we are seeing some benefits from having the cows in those fields. • Thursday 18th September 2014. Phill Luckhurst - Trying to escape political talk everywhere and the fact it was such a stunning day I walked all the reservoirs and many of the surrounding pathways. Bird wise it was surprisingly quiet. Especially noticeable was the absence of the terns that have provided so much enjoyment over the summer. 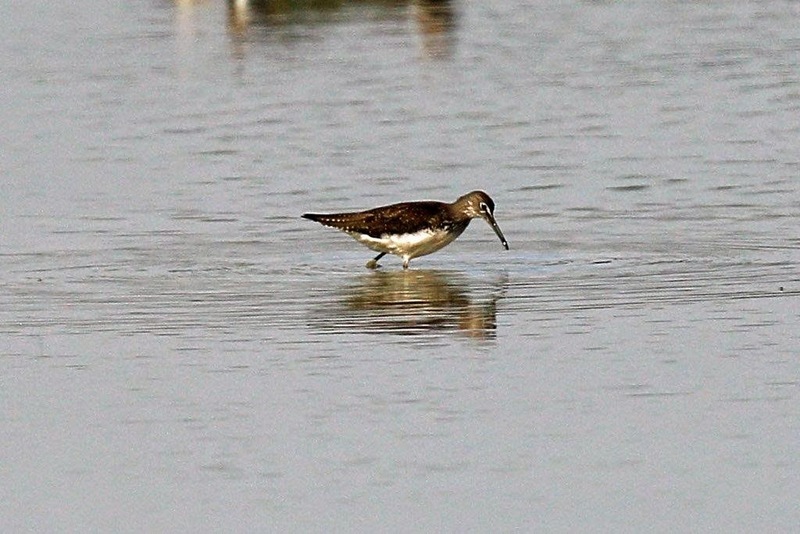 Waders also seemed lacking but in one of the feed streams I did spot this Green Sandpiper. The back of Tringford also had a couple of Greater Spotted Woodpeckers and amongst the numerous small birds I think there was a Spotted Flycatcher still around. There were also a few Bullfinch feeding in the bramble. 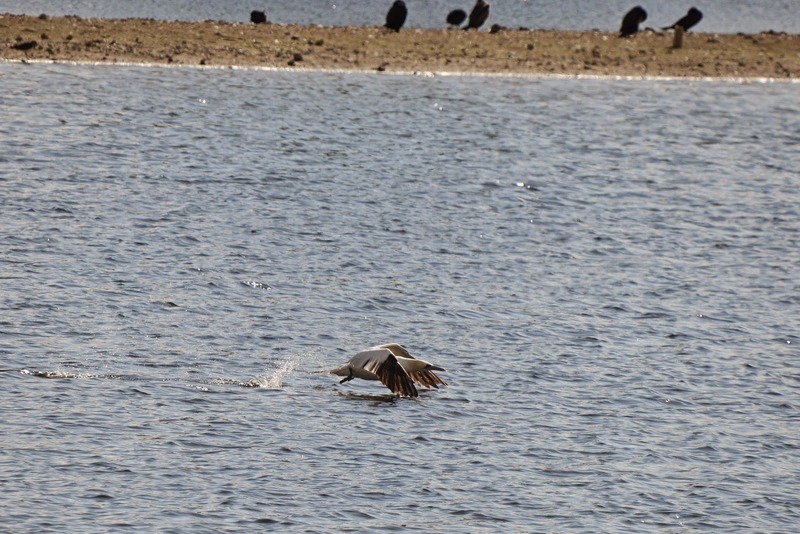 Wilstone had a Red Kite landing on the mud near the Drayton Hide apparently taking a piece of a dead fish. The spit in front was almost empty, not even the lapwings were around. Most of the life had moved over to in front of the jetty. Up along the Wendover Arm were good numbers of Goldfinch with a few Greenfinch and Yellowhammer but little else. Wasp numbers have risen massively but bees seem a lot harder to find as they have been all year. • Tuesday 16th September 2014. 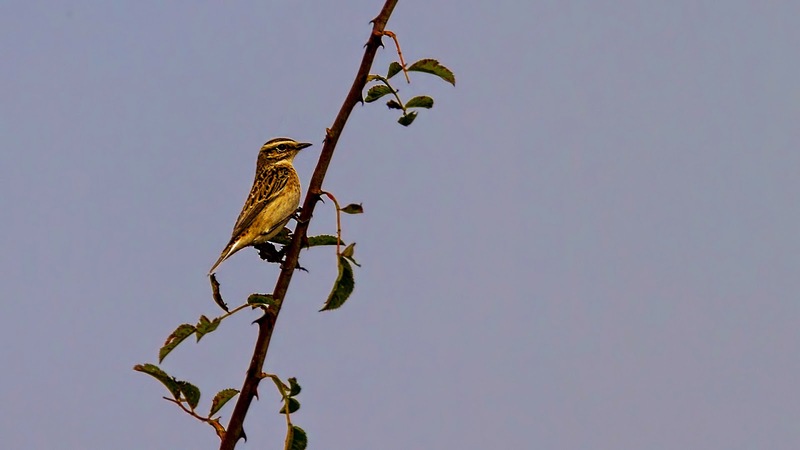 Phill Luckhurst - Not much has changed at the reservoirs today bird wise but it was great to see 3 Whinchat up near the old cress beds. Sadly they were very flighty probably due to the presence of both Kestrel and Sparrowhawk nearby so I could only manage this record shot. Obviously me pointing the big Cyclops eye of my 400mm at them had no effect on their nervousness whatsoever, honest. Tringford had huge numbers of Dragons today all eagerly laying the next generation. 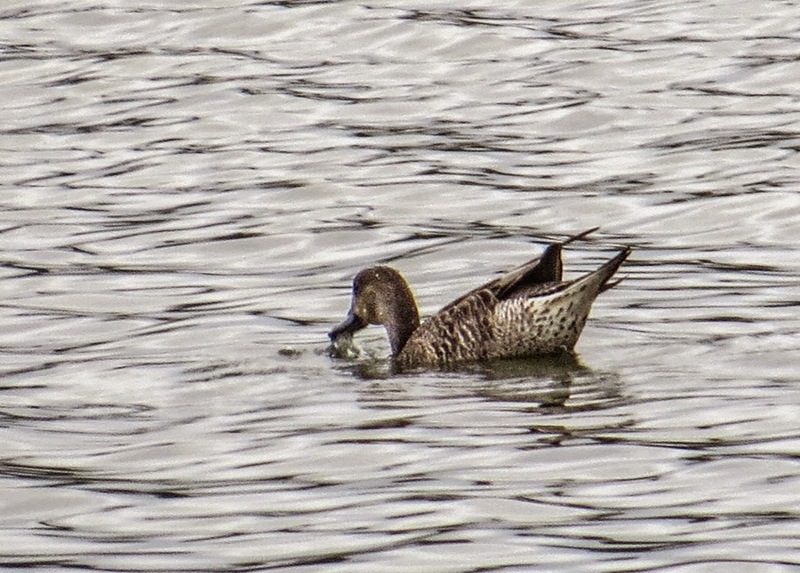 A single Pintail was near the hide along with a Red-Crested Pochard. 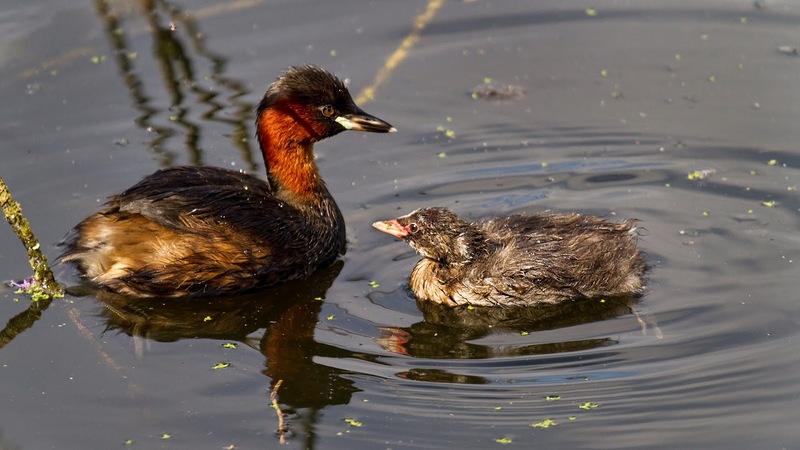 I only saw one Little Grebe today, they only seem to show well when it is nice and sunny. • Monday 15th September 2014. 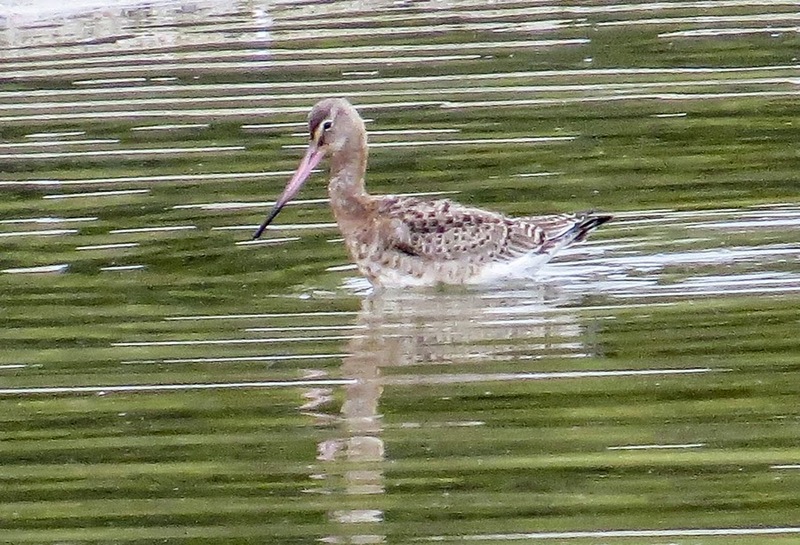 Francis Buckle - Attached 3 low res pics of the Pintail and Black-tailed Godwit yesterday am at Wilstone. • Sunday 14th September 2014. 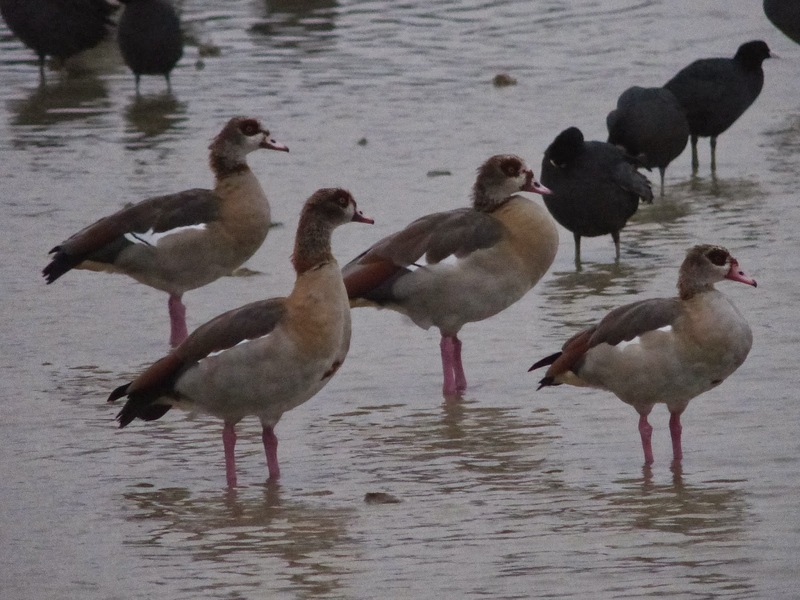 Roy Hargreaves - This morning the four Egyptian Geese were again on the spit and flew off in a north-westerly direction for the second morning in a row. One Pintail by the reeds and two on Drayton Lagoon again and a Shelduck was on the spit. This morning I could only see two Black-tailed Godwits, one Greenshank, one Common Sandpiper, one Green Sandpiper, four Ringed Plover and one Little Ringed Plover. 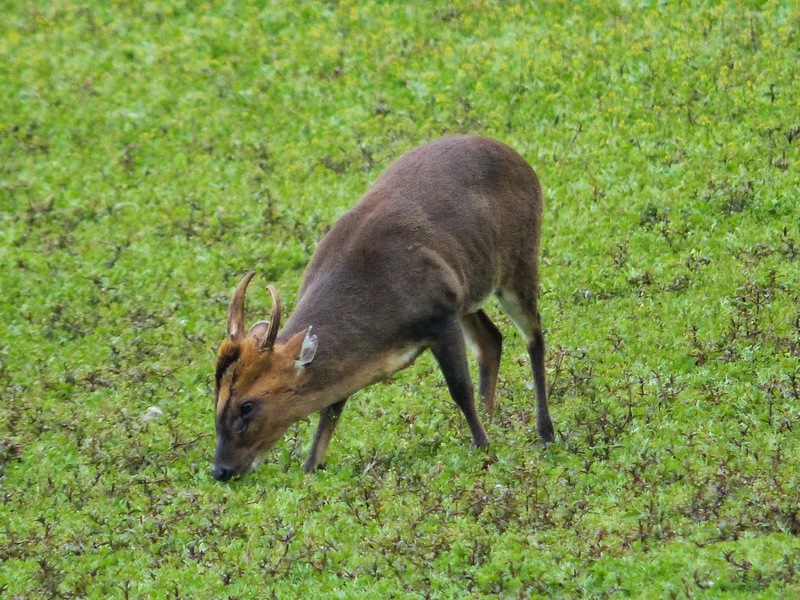 While in the hide this male Reeves’ Muntjac was grazing just the other side of the creek. Tringford had a Red-crested Pochard and this Little Egret that flew off to Startops and was on the mud when I got there. • Saturday 13th September 2014. Roy Hargreaves - I did all of the reservoirs this morning and fog certainly hampered an early start again. Again the four Egyptian Geese were on the spit in front of the jetty again first thing and flew off a bit later this morning – presumably due to the fog. There are now three Pintail about so numbers appear to be building up as normal and one Shelduck is still about. Wader-wise I saw four Black-tailed Godwits, Greenshank, Common Sandpiper, four Ringed Plover, one Little Ringed Plover and a Dunlin. 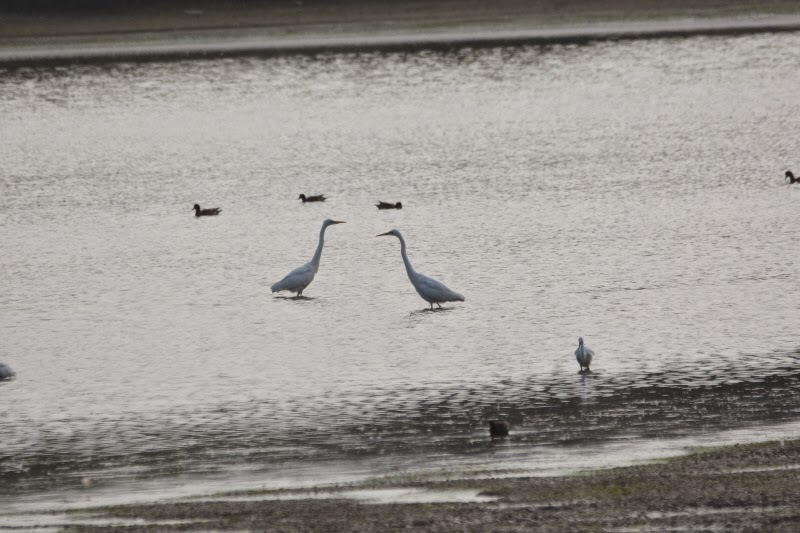 Startops had a Yellow Wagtail and two Little Egrets, which then relocated over to Tringford. I have only seen the colour-ringed bird on the Wednesday and not since. I was doing the WeBS count and so didn’t have my camera with me on that occasion, but if the Little Egret reappears I will try and get a photo. Mike Wallen - Totally fogged out on the hills, so I had a good walk around the 3 smaller ressies. 56 Teal, 3 Common Tern, 1 Little egret, 17 Shoveler, 3 Little Grebe, 8 Wigeon, 2 Pochard and 6 Grey Wagtail. • Friday 12th September 2014. Roy Hargreaves - This morning the overcast conditions made for a dull start. From Cemetery Corner there was an eclipse mal Pintail among the other dabbling duck. As I was stood there I heard geese and saw four Egyptian Geese fly up from the spit and off towards the small reservoirs. Apparently four Egyptian Geese were on Wilstone yesterday too so they appear to be lingering in the area. A Shelduck was still about and there was slight change on the waders front as I could only find one Black-tailed Godwit, five Ringed Plover, one Little Ringed Plover, one Dunlin, two+ Green Sandpipers and a Common Sandpiper. Round the back there is a flock of at least 129 Linnets (that is what I counted on my photograph anyway), near the cress beds in the fields and they attracted the half-hearted attention of a Hobby and the more determined attention of a Sparrowhawk. 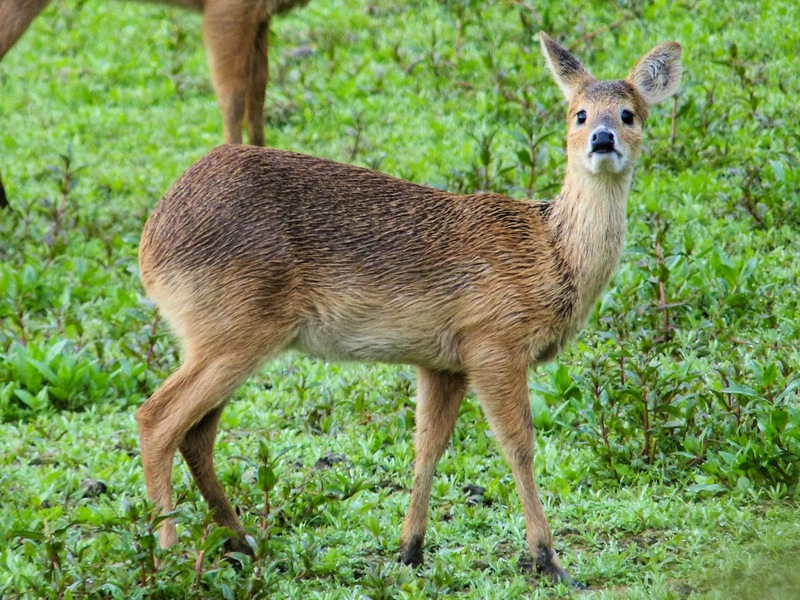 Larger mammals comprised three Reeves’ Muntjac, three Chinese Water Deer and two Foxes. Thanks to Mike Collard I know that the colour-ringed Little Egret that I saw yesterday was one of the young hatched this year at Verulamium Park. They were ringed in June and apparently this is the first report of any of the young after they left the park. • Thursday 11th September 2014. Roy Hargreaves - This morning the number of Ringed Plover on Wilstone had increased to five with one Little Ringed Plover vaguely associating with them. 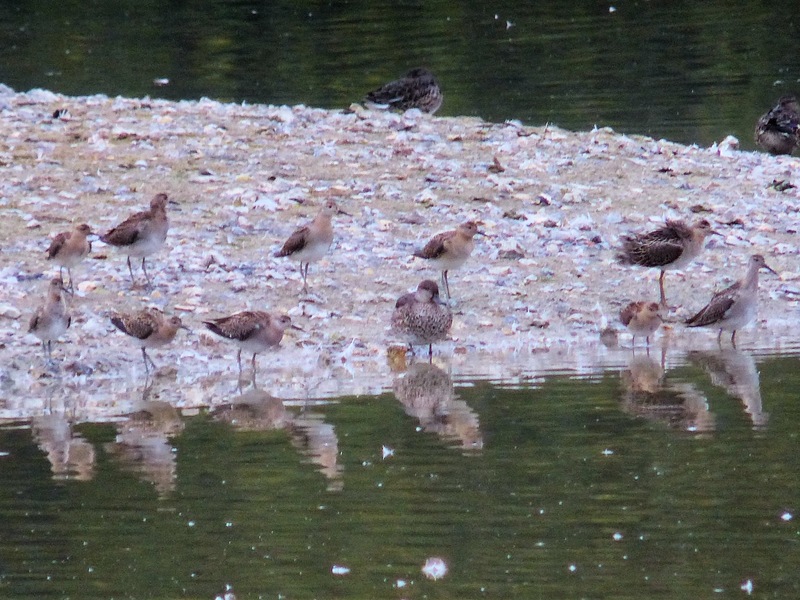 Also a juvenile Dunlin, Greenshank, 2+ Green Sandpiper, 4 Black-tailed Godwits and 1+ Common Sandpiper. 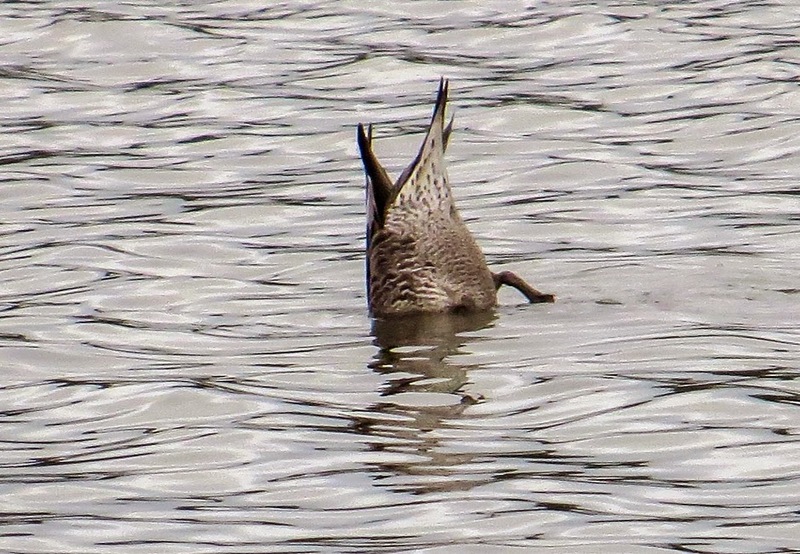 On the wildfowl front an eclipse male Pintail is the first that I have seen this autumn and a Shelduck is also about. Yesterday 3 Red-crested Pochard were on Wilstone and two escaped Whooper and 2 escaped Black Swans were on the spit by the jetty. 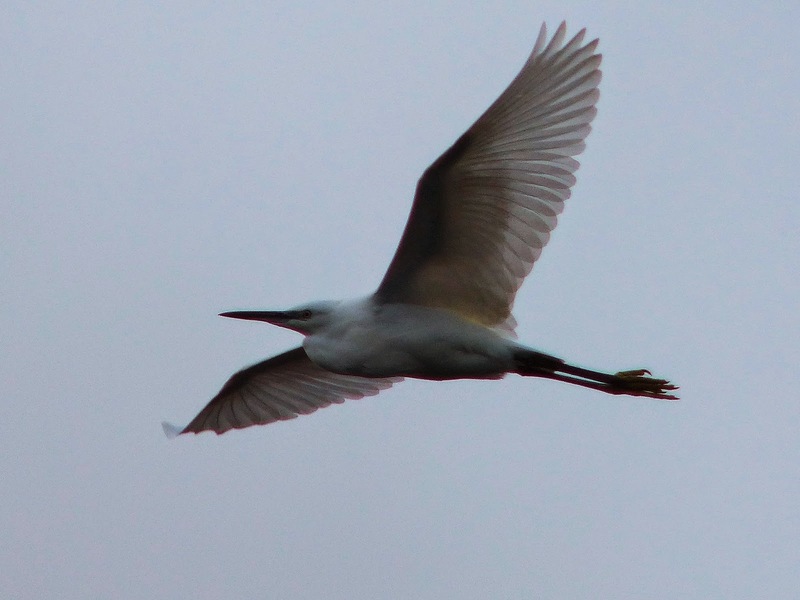 A colour-ringed Little Egret was on Tringford and then Startops and I will report back if I find out more as I have the colours and letter and number so I am hopeful. Numbers of Common Tern are dropping but still they are around much later than normal. • Tuesday 9th September 2014. 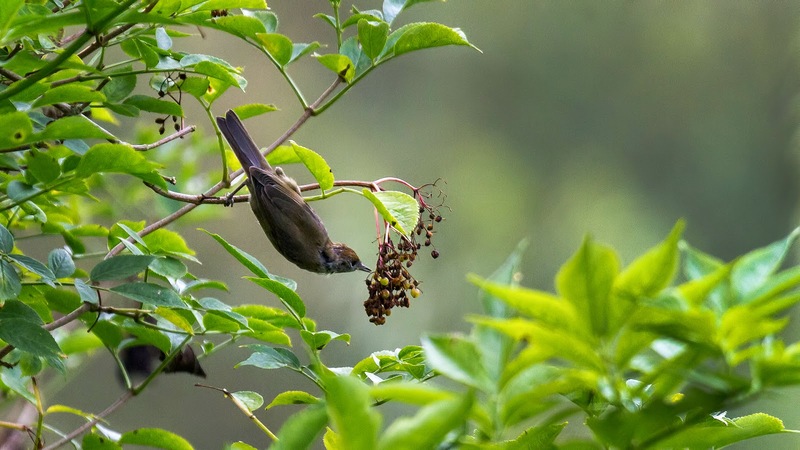 Phill Luckhurst - Today was a colourful day where bird life is concerned. 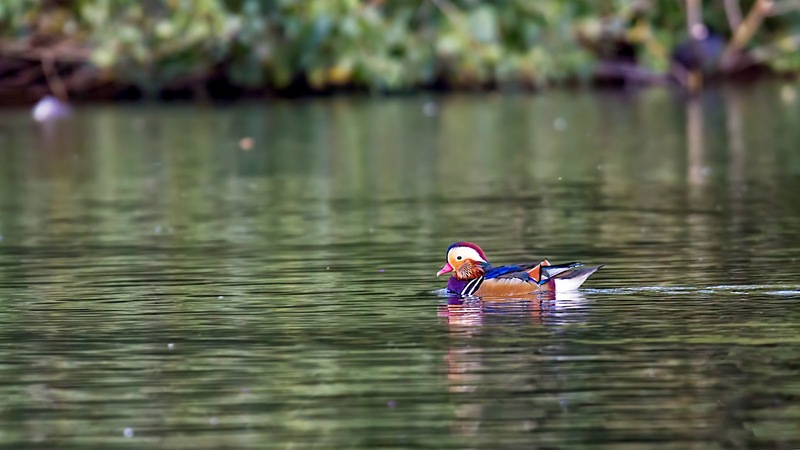 At Tringford a male Mandarin was swimming around and in front of the hide a Little Grebe was feeding its young. 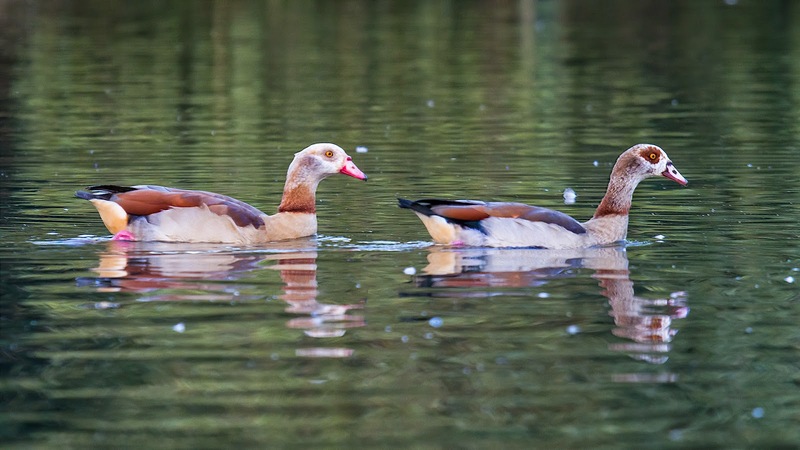 Later in the day I visited Wilstone where the colour was from a brief visit by 2 Egyptian Geese. Neither were ringed so not the pair from Rickmansworth. Later a few of us were sat in the Daryton Hide watching some young deer play and feed. 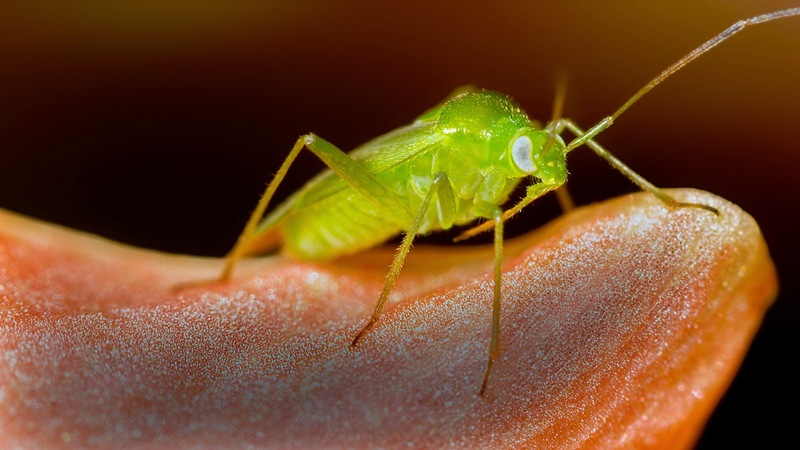 While it is not obvious from the pic the front of the two has a pronounced limp in one of its back legs. It seems to be moving ok at speed so hopefully it is nothing nasty. 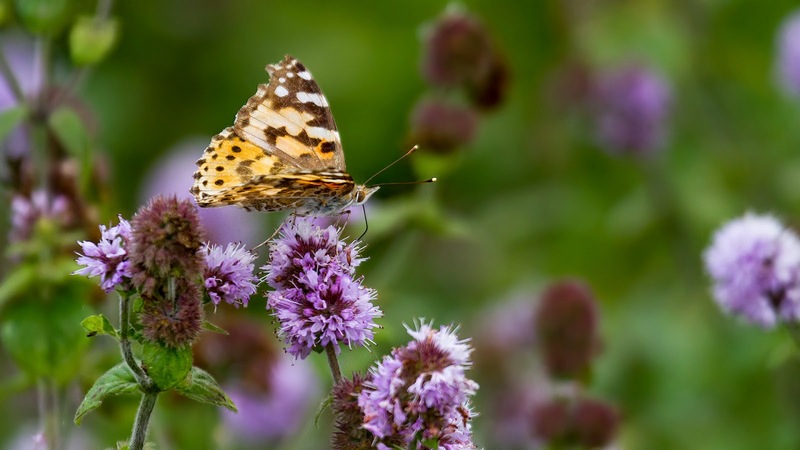 Roy Hargreaves - This morning I walked down to Wilstone in the dark and heard a male Tawny Owl near Miswell House and a male and Female Tawny Owl at the back of Wilstone. There were no waders by the reeds and from the jetty I checked the lengthening spit and saw six Ruff scattered feeding along it. I found out from someone in the hide that they had turned up late morning on Monday. By the overflow on the mud I could see one Little Ringed Plover, four Ringed Plover, a Greenshank, and Common and Green Sandpipers. From the hide I saw three Snipe and the light off to the right was dire and anything could have been out there to be honest. This evening a futile attempt to see five Egyptian Geese that Steve Rodwell had texted me about result in three Little Egrets at Startops but little else of note. Francis Buckle - 3 Little Ringed Plover, 2 Green Sandpiper, 1 Greenshank, 3 Black-tailed Godwit, From the Drayton Hide at 11:00. • Monday 8th September 2014. Steve Clark - Wilstone, 6 Ruff at 12:10 today for about five minutes! They arrived and fed to the left of the hide. • Sunday 7th September 2014. 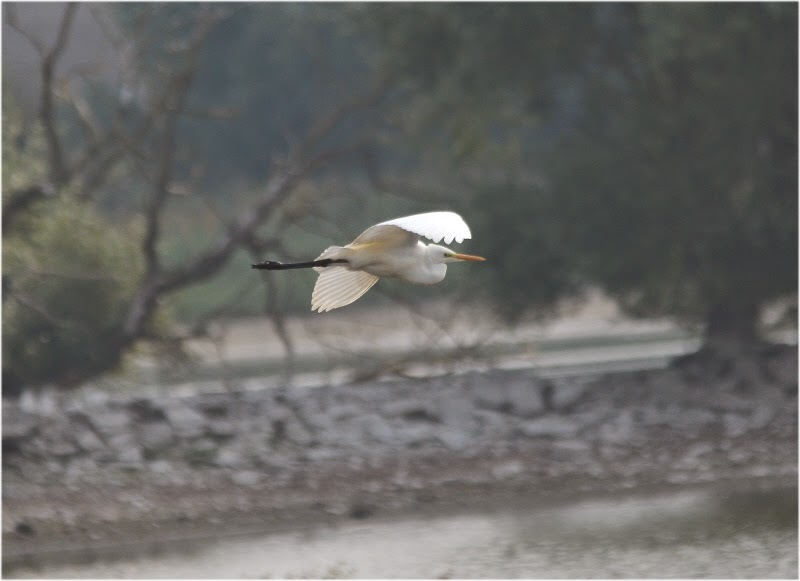 Ian Williams - The Great White Egrets were present from about 9.40 until just after 11.30 when I picked up what I was pretty certain was them flying away over the jetty and circling, gaining height. Certainly I know Roy failed to see them from the jetty area about 15 minutes later, an area where they would certainly have been seen as they had last been seen from the hide walking behind the bushes on the Drayton bank. 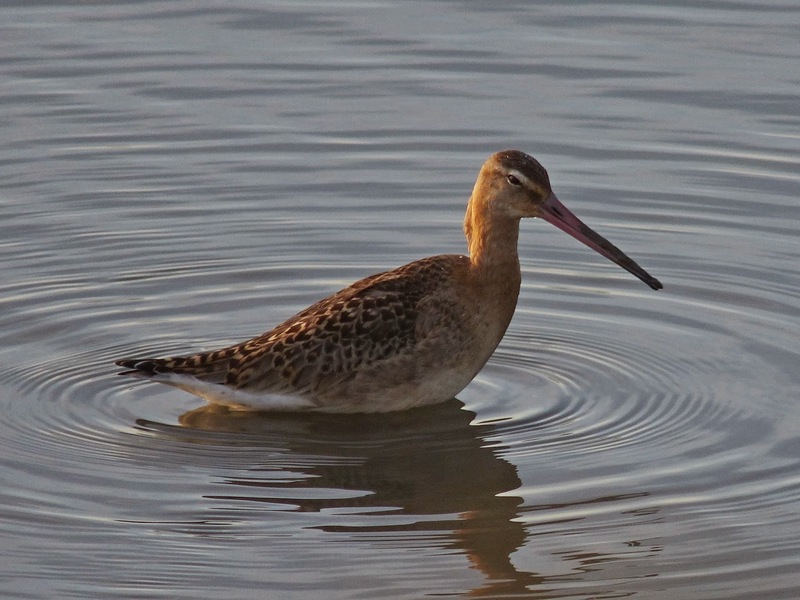 Photos of the ruff and egrets attached. 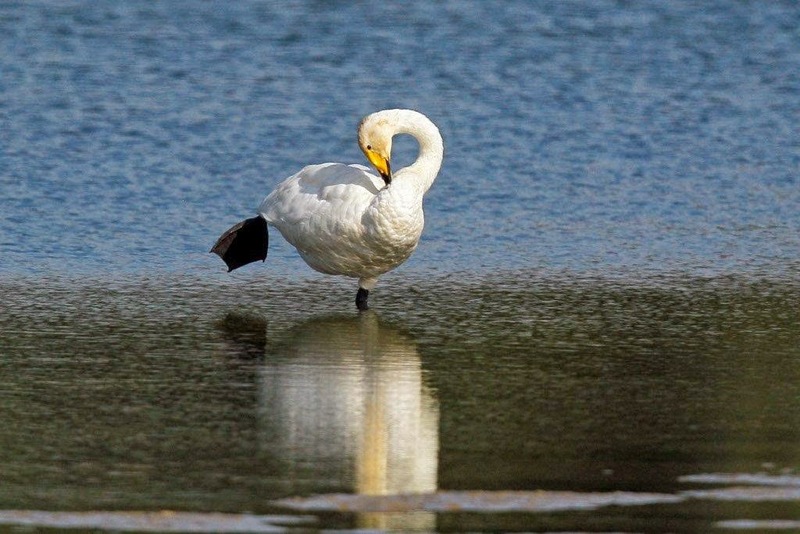 Roy Hargreaves - The highs and lows of birding were perfectly encapsulated today at Wilstone. I walked down first thing and it was dull and overcast and started with a couple of Black-tailed Godwits and a couple of Greenshank on the mud visible from Cemetery Corner and a female and fawn Reeves’ Muntjac by the hedge. From near the siphon I spotted a small flock of medium-sized waders landing on the small island by the mudflat and expected them to be Golden Plover and so was pleasantly surprised to see that they were Ruff. I counted seven and then got closer and managed to see all ten of them. After Ian had joined me it was no surprise that everything went up as a female Peregrine flew round looking for breakfast. I assume that this is the 1st summer female I saw perched in a tree a few weeks ago round the back. At one stage in the proceedings five Black-tailed Godwits joined the Ruff and they all headed out into Bucks only to return and settle back on the mud. Also the two Little Ringed Plovers were on the mud in the same area as the Ruff. Later I managed to miss the Great White Egrets by five to ten minutes and on my third visit I found a juvenile Mediterranean Gull on the mudflat in the middle of a Black-headed Gull flock but again still no Great White Egrets. Maybe I’ll get the next one. Having missed about six or seven sightings since 2008 and only seen one in that same period they aren’t easy by any means! 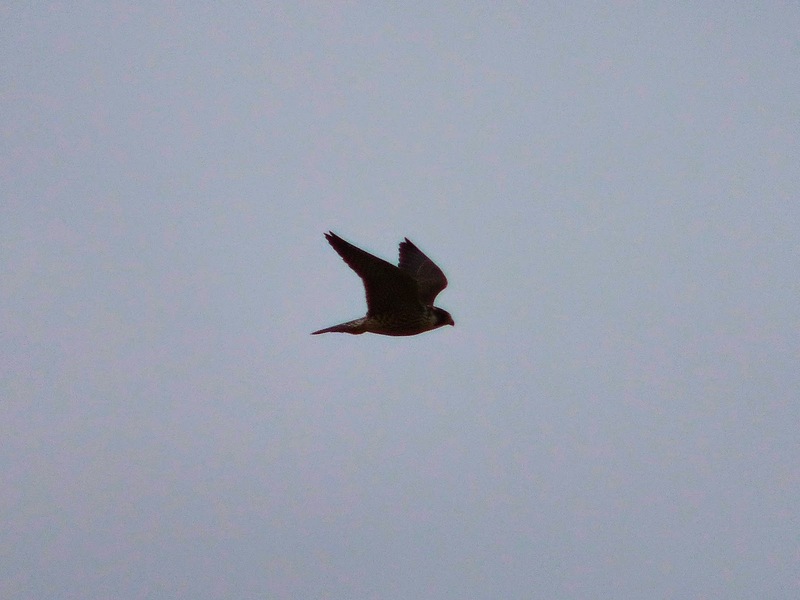 I have included record shots of the Peregrine and the Ruff and their lack of quality is easily explained by the dull conditions etc. 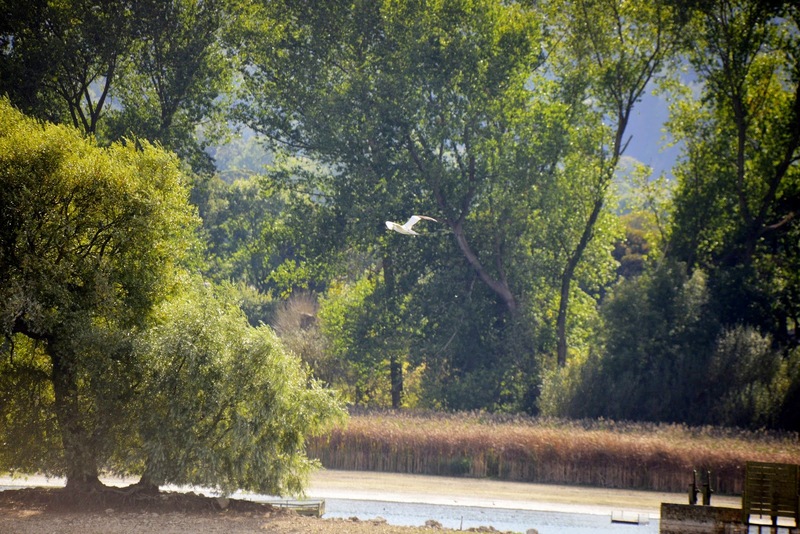 Ben Miller - The two GREAT WHITE EGRETS, seen flying over Weston Turville by Tim earlier, are still on Wilstone, currently resting on the Drayton Bank. The 10 Ruff present earlier at Wilstone have departed, but other birds still present include Greenshank, Blackwits, Ringed Plover, Hobby and Wheatear. • Saturday 6th September 2014. 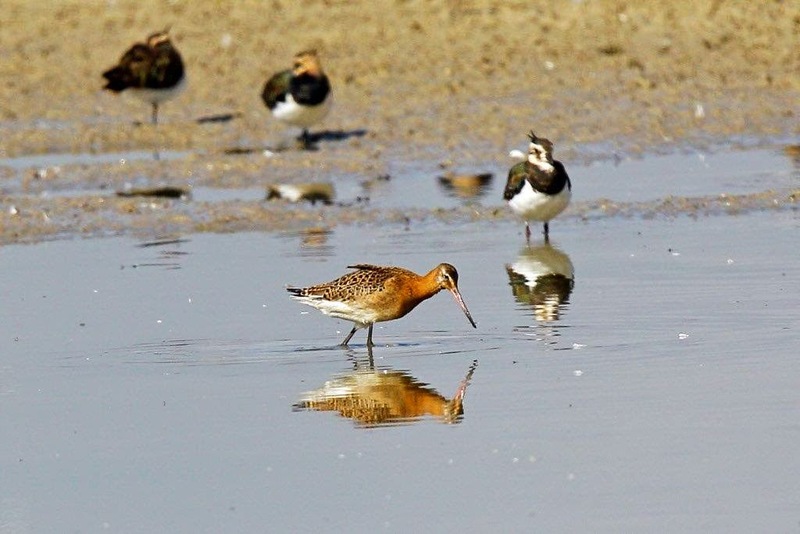 Roy Hargreaves - This morning I started at Wilstone where I saw eight Black-tailed Godwit, three Greenshank, two Little Ringed Plover, 2 Green Sandpipers, 3 Common Sandpipers and four Shelduck still about. Yellow Wagtails were calling but I didn't see them. Also I saw five Chinese Water Deer and a Fox and the two Whooper Swans. Tringford had five Red-crested Pochards and Startops had a Little Egret. On the hills I saw the two Whinchats and flocks of Linnets, Meadow Pipits and Goldfinches were mobile and a Raven flew over. • Friday 5th September 2014. Mike Wallen - A really quick look with bins only- Startops - juv Black Tern still, 1 Little Egret. Marsworth - 1 Hobby Wilstone - 3 Hobby, feral Whoopers and 3 Little Egret. 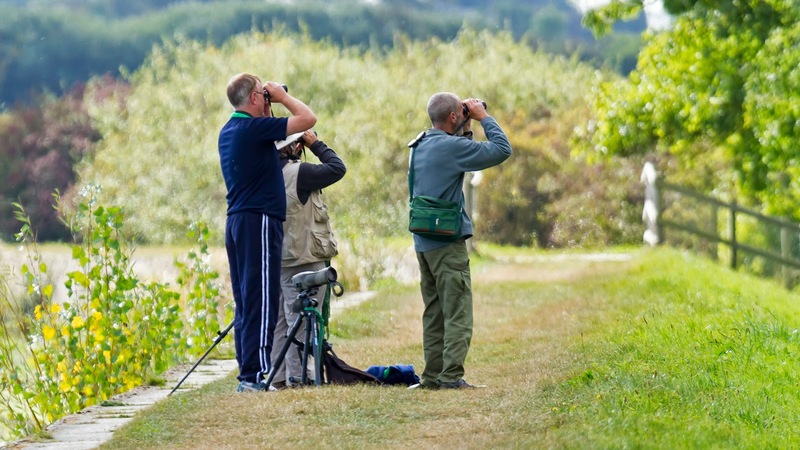 There was no doubt waders at the latter but no time and no scope ! • Tuesday 2nd September 2014. Roy Hargreaves - This morning was quiet but a quick update on other matters. There are now cattle in the meadow behind the hide and being youngsters they can be curious. I could also tell that the days are getting shorter as I walked down to Wilstone and could hear a Tawny Owl hooting in the trees by the Waddesdon Estate gate. 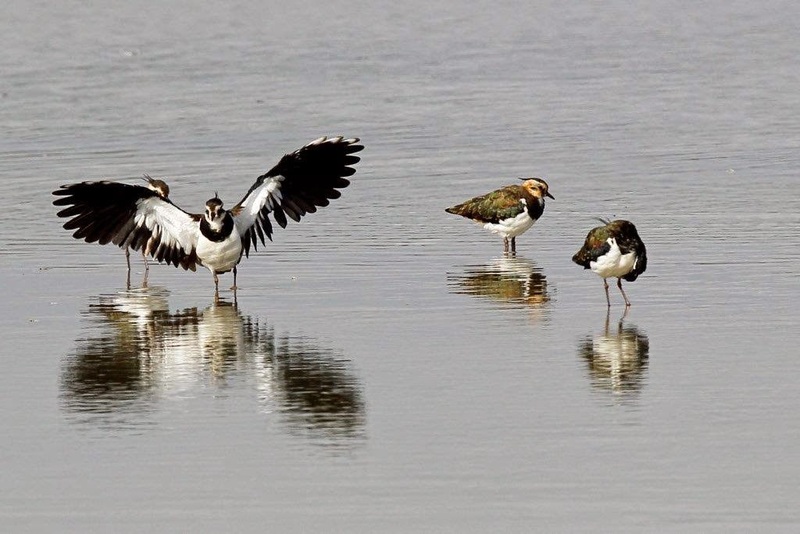 The Shelduck numbers are back up to four again and the waders seemed largely unchanged from yesterday. By the way I posted late last night and the mystery bird being fed was a young Little Egret. Curiously I saw what I assume was the same bird today and couldn’t see a ring on it so it may not be a local bird at all. 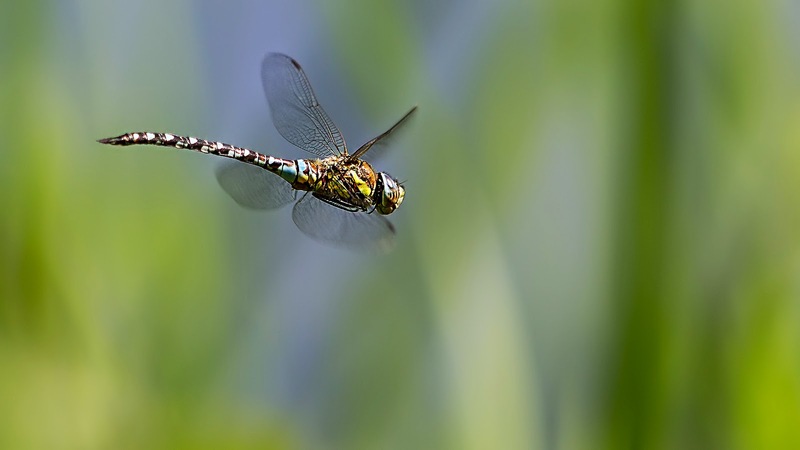 Phill Luckhurst - I had an early start today over at Tringford where the sunshine had bought out massive numbers of Dragonflies, Butterflies and Moths. 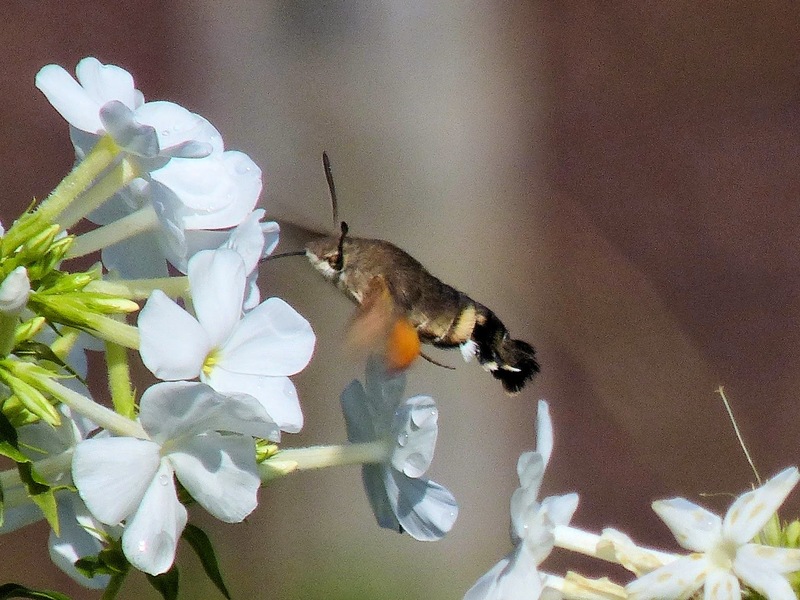 It was great to see a Hummingbird Hawk Moth feeding albeit at a distance. First I have seen this year, last year there were loads at Wilstone but the water was still high. In front of the Hide there were 8 Little Grebe and a Buzzard circled above. I then left as a lady was playing fetch the stick with her dog in front of the hide. 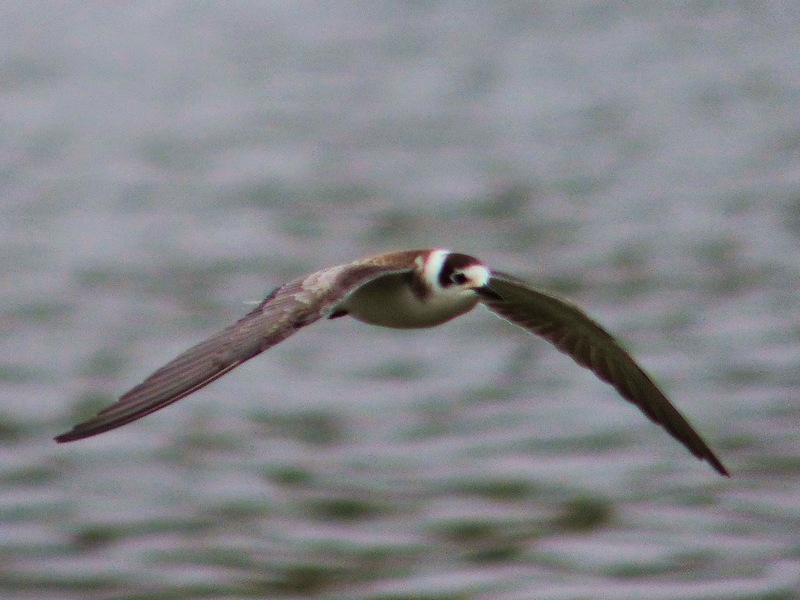 Wandering around Startops and Marsworth it was great to see the Black Tern still around. There were plenty of insects too and as the day went on the flying ants left their nests en masse. 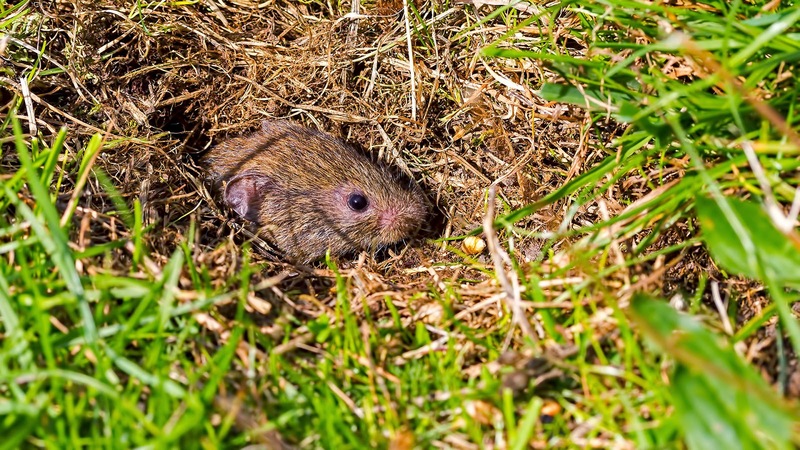 While I sat photographing the ants an inquisitive Vole kept popping out of its hole, it didn't seem bothered by me at all. 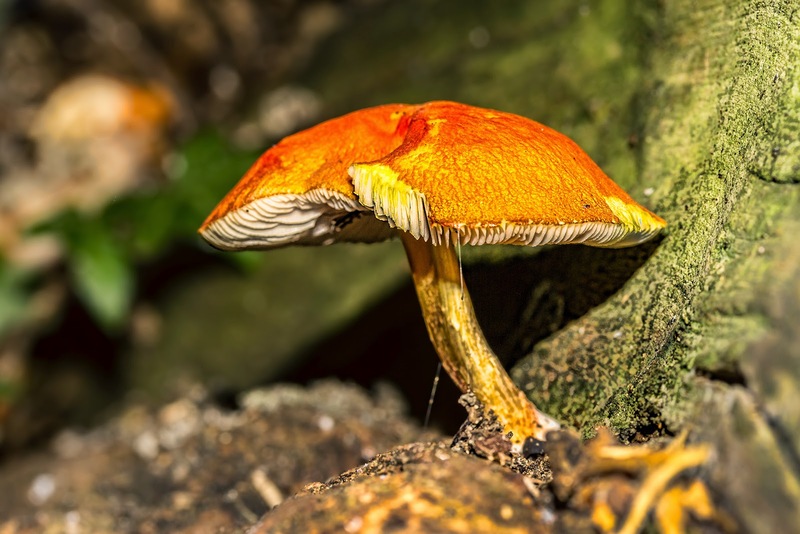 It is also the beginning of the fungus season with loads popping up around the reservoirs. Over at Wilstone many were out enjoying the sunshine. Bird wise not a lot has changed since yesterdays report. 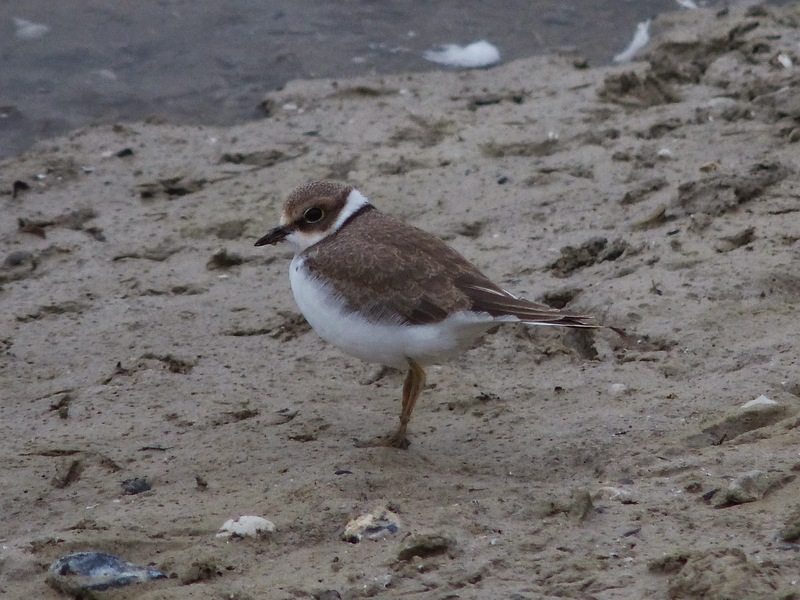 The Little Ringed Plovers were very active and I also spotted a Ring-Necked Parakeet fly over. To the right of the hide briefly popping out of the reeds were 6 Snipe but never visible for long. 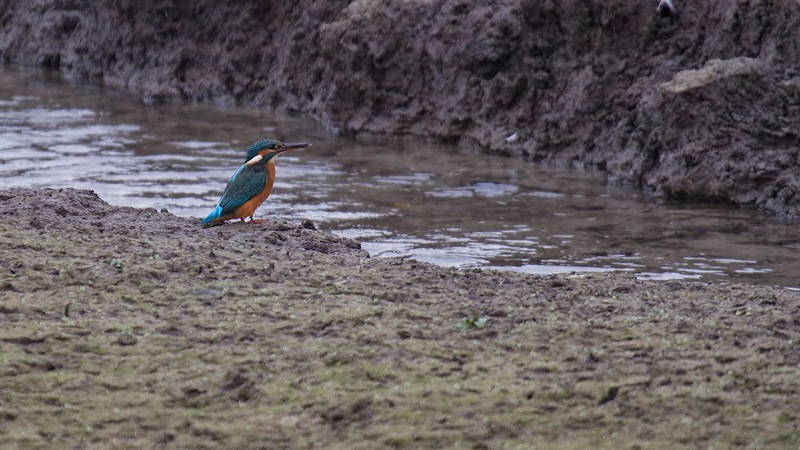 It was also interesting to see a Female Kingfisher landing on the mud by the stream, it is not often you see them land other than on a perch, same happened yesterday morning. She is ringed. • Monday 1st September 2014. Roy Hargreaves - The forecast promised dull and damp so I headed down in the car and did all of the reservoirs. Starting at Wilstone from the jetty there was a Common Redshank, a Black-tailed Godwit, several Wigeon and an eclipse male Red-crested Pochard visible from there. I also had several Yellow Wagtails flying about. While stood by the car park a Ring-necked Parakeet flew over me heading south-west in Bucks. 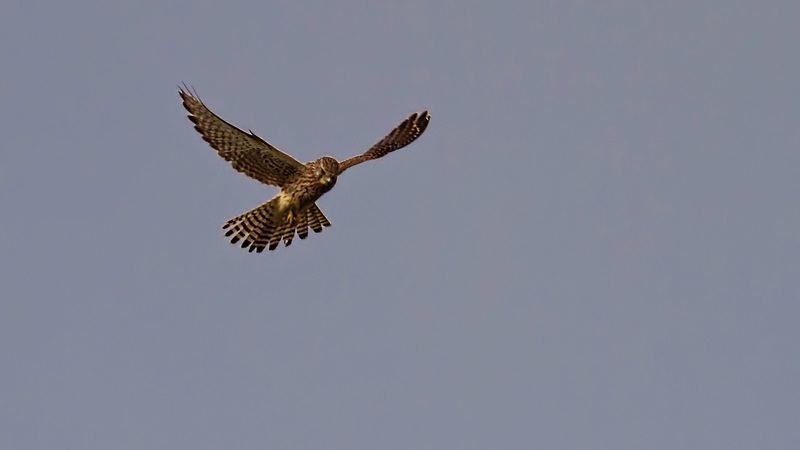 David and I also saw it last week flying over the hide heading towards Tringford – so this bird is definitely on a regular route even if timings vary. The two juvenile Little Ringed Plover were on the mud closest to the overflow and seven Black-tailed Godwits were also in that area. From the hide two or three Greenshank were scattered around (I didn’t count them – oops!). A further Black-tailed Godwit off to the right made nine in total. Also three Shelduck were still about and 2 Green Sandpipers and at least three Common Sandpipers. What was interesting was that one of the nestlings seems have to have left the nest. It has scraggly feathers sticking up on its head and was demanding and getting food from at least one adult. David and I checked the nest and could see nothing, but that doesn’t mean much as they can be completely obscured. It was also interesting to note a young flightless Common Tern still on one of the tern rafts – definitely much later then we have experienced before on Wilstone. Normally by now the Common Terns have departed. First Startops then Marsworth played host to the Black Tern and I finally got an adequate photo of one as they are normally too distant for my camera. It was still overcast but I was pleased with the result even if it isn’t a prizewinner – now for a White-winged Black Tern this week. 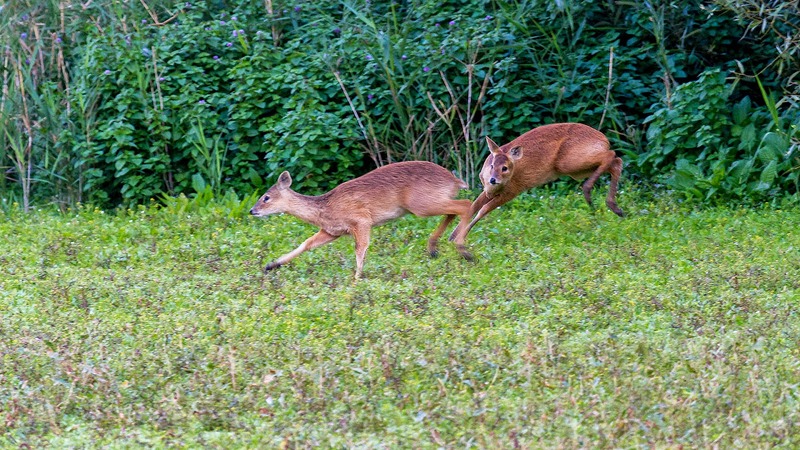 Mammal-wise it was the turn of the Reeves’s Muntjac, with one by the jetty and two by the hide, although a Chinese Water Deer appeared out of the reeds in the distance. 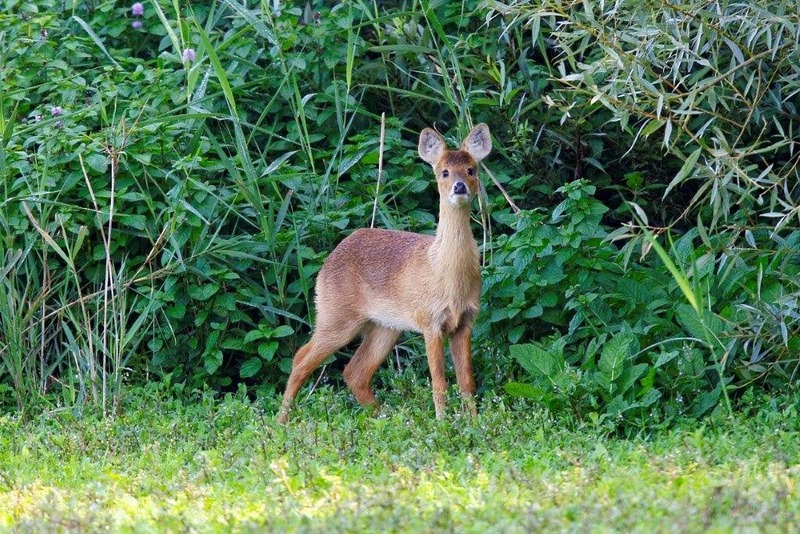 On a general note the Chinese Water Deer are sometimes very co-operative first thing as this one was on Saturday. I also had this Hummingbird Hawk-moth in my garden this afternoon in a brief sunny period. more difficult as the birds are further away, but sometimes the late afternoon light can compensate. 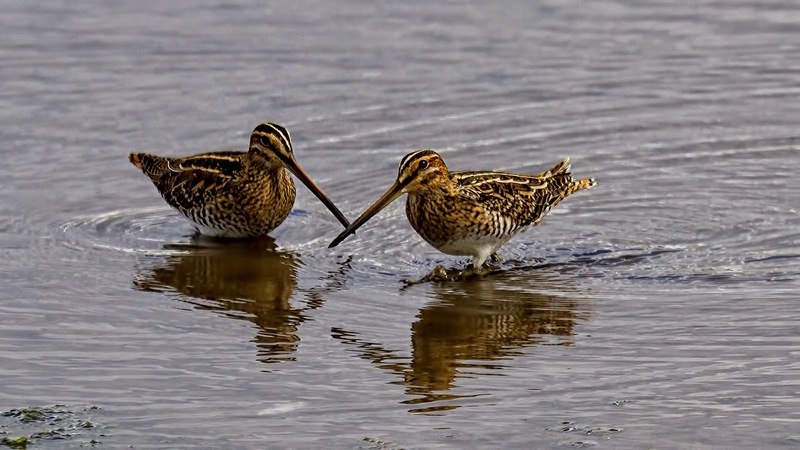 Images of SNIPE, BLACK TAILED GODWIT, GREEN SANDPIPER, WHOOPER SWAN, LAPWING AND CHINESE WATER DEER attached. Some HOBBIES seen to right of hide (LOTS of dragonflies about). 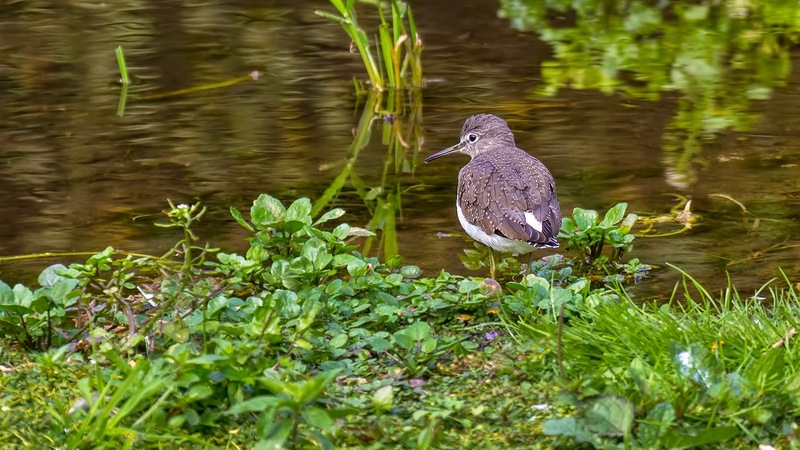 COMMON SANDPIPER and KINGFISHER and TEAL about. Francis Buckle - Wilstone all the regular waders including 3 Greenshank and 2 Ringed Plover, Startops the juv Black Tern is still showing well. 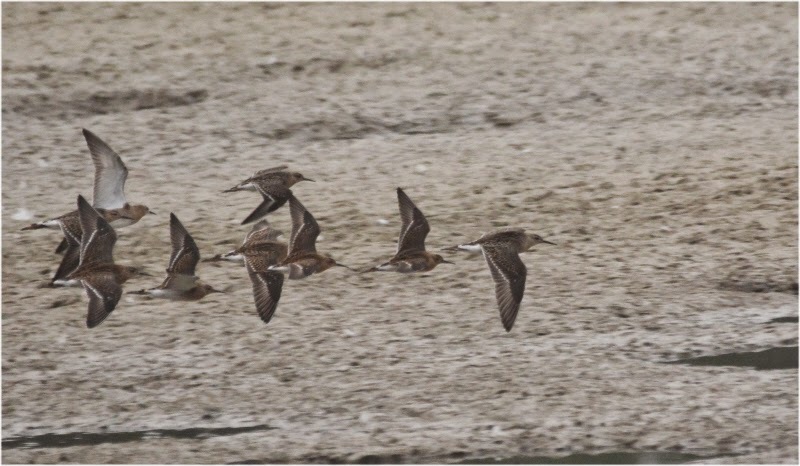 Sally Douglas - In addition to above - Juv Little Ringed Plover, 3 Black-tailed Godwits; 1 Redshank; 2 Common Sandpipers; 1 Green Sandpiper & 1 Common Snipe.